NEW BERLIN, N.Y. (September 7, 2014) - The 2014 AMSOIL Grand National Cross Country Series presented by Maxxis, an AMA National Championship, descended upon New York's legendary Unadilla Valley Sports Center on Sunday for the tenth round of the 13-race GNCC series. Factory FMF/KTM's Kailub Russell every lap of the three-hour competition, further extending his points lead in the XC1 Pro class as the series approaches its final three rounds of racing. KTM Support rider Grant Baylor put in an impressive ride to capture the XC2 Pro Lites victory and fourth overall for the day, finishing only three seconds shy of securing an overall podium at the tenth running of the Can-Am Unadilla GNCC. 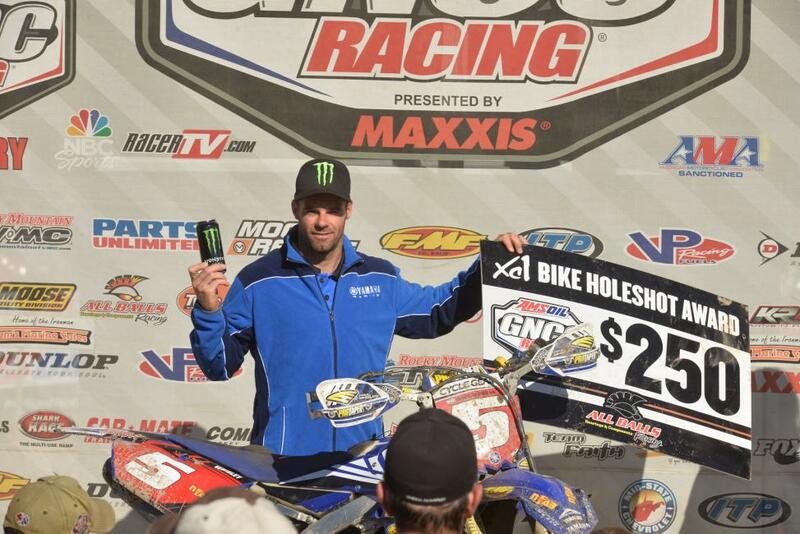 As the green flag dropped for the XC1 Pro bike start, it was N-Fab AmPro Yamaha's Paul Whibley who captured yet another $250 All Balls Racing XC1 Holeshot Award. Whibley didn't hold the lead for long, though, as Russell put himself out front as he entered the famed Unadilla motocross track. Whibley maintained second early on while Factory Husqvarna's Andrew Delong, Rockstar Energy Racing/WMR KTM's Ryan Sipes and N-Fab AmPro Yamaha's Jordan Ashburn all settled into the top five on the opening lap. After the first two laps the running order flip-flopped quite a bit as the front-runners began approaching lapped traffic amongst the 360 racers scattered over the 9-mile course. RideMPS.com/AMSOIL Honda's Thad DuVall went down on the opening lap, where he checked in as far back as tenth place. Ashburn experienced his first crash of the day on the second lap, dropping outside the top ten due to several pit stops used to tweak the front end of his bike. As DuVall and Ashburn experienced minor setbacks in the beginning, Rocky Mountain ATV*MC/N-Fab AmPro Yamaha's Josh Strang and JCR Honda/Rockstar Energy's Chris Bach charged toward the front of the pack and engaged in a race-long battle for a podium position. With Russell out front commanding a comfortable pace, Bach continued to chip away, where he was able to close the gap to only 15 seconds on Russell's early lead. In fact, Bach's early pace was good enough to earn the Indiana native an extra $150 courtesy of the KR4 Performance Fastest Lap Award, which he earned on lap two with a time of 20:39.8. Meanwhile, DuVall put on a valiant charge toward the front where he worked his way into the second place position just after the halfway mark. And that's when the four-way battle ensued between DuVall, Bach, Strang and Delong. As the lappers became more prevalent, passing strategies became even more important to the front-runners. As DuVall cleared his way through a mass of riders, Bach got caught up and went down, allowing Strang to eventually catch and pass him for third. However, that didn't seem to faze Kailub Russell, who successfully led every lap of Sunday's three-hour race. Russell's feat is a continuation of an impressive four-race winning streak where he's led each and every lap-totaling 26-through the last four rounds. Russell's victory also gave the 2013 National Champion his 20th career overall victory as he continues his bid for a second straight title in 2014 with a 50-point lead over second place. "I'm glad I was able to get the win today and increase my points lead heading into the final three rounds," Russell said. "I'm already looking forward to a rock race in a couple weeks in Pennsylvania, it's going to be fun!" DuVall put in an impressive come-from-behind performance to capture second overall for the day, finishing only 27 seconds behind Russell in the overall. Perhaps the key for DuVall came in a switch up in machine choice, as he rode the Honda CRF450 rather than his previous machine of choice in the Honda CRF250. "I usually don't feel as comfortable on the 450 as I did on the 250F but we spent all summer testing the 450 and raced it at a local race and now I love it," DuVall said. "Especially on this Unadilla track, I was able to ride in a higher gear and I think it helped out a lot." Strang maintained the third place position on the final lap, where he rounded out the overall podium for the day. Strang's third place finish allowed him to move into second place in the championship standings, where he now sits 50 points back from Russell's lead. "Third place isn't where I'd like to be obviously but I'm glad to finish on the podium and keep working to get that win this season," Strang said. Despite running second for a majority of the race, Bach finished fourth in XC1 and fifth overall for the day after a series of crashes slowed his momentum down late in the race. Delong rode a comfortable pace in the final laps, finishing six overall for the day, followed by Whibley in seventh, Japan's Takeshi Koikeda in eighth and Ashburn salvaged a ninth place overall after a rough day of coming through the pack. XC2 Pro Lites points leader Grant Baylor once again made waves in the overall running as the young gun came within three seconds of finishing atop the overall podium on Sunday. Baylor engaged in an early battle with XC2 rookie Trevor Bollinger and the duo quickly worked their way into the XC1 front-runners on time adjustment. Bollinger kept the pressure on Baylor throughout the first half of the race but Baylor soon set a pace that just couldn't be matched by the North Carolina native. Baylor's victory marked his third consecutive win this season, where he now enjoys a 29-point lead over Raines Riding University/Atlas Cycles' Ricky Russell in the championship standings. Bollinger currently sits third place in the championship standings with two consecutive podium finishes behind him. KR4 Arrive-N-Ride KTM's Nick Davis began his afternoon outside of the top ten in the XC2 class but the Pennsylvania native quickly began picking his way through the pack. By the mid-way point, Davis had made his way into third and he maintained that position throughout the remainder of the race to claim his third consecutive podium finish this season. In just his second GNCC appearance of the season, Rhode Island's John Day captured the $100 DigitalOffroad.com XC2 Holeshot Award where he eventually finished 18th for the day. Pennsylvania's Craig Delong earned the $125 American Kargo Top Amateur Award with 17th overall, while grabbing the 250 A class win at Unadilla. Factory FMF/KTM's Martinez atop the podium once again. KR4 Arrive-N-Ride's newest team member, Sarah Baldwin, put in a hard fought battle, where she led Martinez for a portion of the race. Baldwin finished a career-best second overall, as well as second place in the WXC division. N-Fab AmPro Yamaha's Becca Sheets rounded out the WXC podium with a third place finish in the class. Massachusetts native Paul Goyette captured the Super Senior A (45+) win, in addition to third place overall for the day. South Carolina's Cole Mattison made it seven-in-a-row on Sunday with the Youth overall victory, as well as the Super Mini (14-15) class win. Mattison was joined atop the podium by Tennessee's Sam Thurman in second and North Carolina's Conner Smith in third. The 2014 AMSOIL Grand National Cross Country Series will head to Somerset, Pennsylvania September 20 and 21 for the Car-Mate Mountain Ridge GNCC. For more information on the series, visit www.gnccracing.com.